Welcome to the Wolf Hammer Game. The game handles many of the nuances of the Wolf Hammer Game with variable options during the setup and playing of the game. The game handles from 4 to 7 players. The game also allows you to optionally play a side game of swing or trash for selective players. The game enables you to enter and save the course or courses that you play on a regular basis. All you have to do is enter the name of the course and the par and handicap rating for each hole. When the game is played you will enter the slope rating for the tees that you are playing on that day and the course handicap for each player will be adjusted. The game also enables you to enter and save the players and their handicaps that plays with your group. 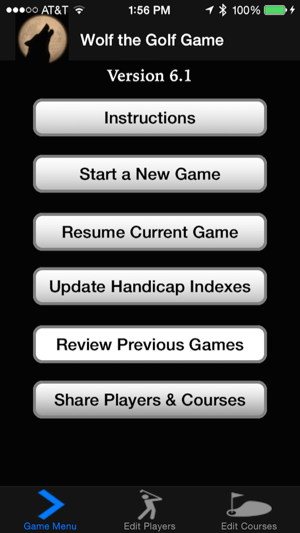 If a player’s handicap index has changed then you can select that player and enter the new handicap index. If you have entered the GHIN or GAM number for the player's you can automatically update the player's handicap from the GHIN or GAM website. You must enter the “Slope Rating” and "Course Handicap" for the tees that you are playing, enter the bet amount, starting hole, handicap percentage and select whether you wish to play carries. You chose the course that you are playing and select the players in the order that they will tee off. After the hole has been completed, you enter the team for each player and their score for the hole. After teams and scores you set the number of hammers for that hole and continue. The results from the hole will be displayed. You have the ability to go back hole by hole to correct a previous error. You also have the ability to change the starting bet for each hole. If you are playing trash, you will go to the Trash screen and select the trash for each player before you continue to the hole recap screen. If your version of "Wolf" allows you to modify the money distributed to each player the app allows you to change the hole total for each player on the hole recap screen. You have the option to review the player's score hole by hole before finalizing the results. The results of the game will be kept for a period of time. From the previous results screen you have the option of e-mailing the results (Scores with or without the Money) to an e-mail account like the pro shop for posting of the scores. Updated for IOS 11. Removed ability to update handicaps by GAM. App is very good, need to be able to double the bet for birdies and courses. It keeps the scorekeeping easy. Terrible app for $10. Was hoping it would be easy & user friendly. Boy was I wrong.